These are all great reasons, but when you stop and think about it, aren't these the minimum standards of doing business? Many financial institutions focus on auto lending to grow market share. And, that’s a good strategy, since auto lending is on the rebound. The bad news is yields are down, and competition is stronger than ever. It’s no secret that consumers today have more choices and less time than ever before, and they’re bombarded with marketing messages that are all the same—i.e., low rates and great terms. Go to any financial institution’s website and you’ll see what I mean. This “same-ness” in message is causing people to tune you out. Marketing guru, Seth Godin, calls this type of behavior the "Purple Cow." Let’s say you’re driving along a long country road, and you see some cows—cows are boring and invisible, and after a while, you fail to notice the cows altogether. But what if you saw a purple one? You would stop and take notice. 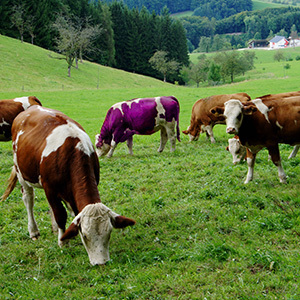 How do you make your marketing message stand out like a purple cow? The answer is a compelling offer—something of value tied to YOUR loan and YOUR institution that your borrowers can’t get anywhere else. A great example of a compelling offer is the Hyundai Assurance Program vehicle return protection first rolled out 2009. The offer was simple: buy a new Hyundai, and if you lose your job in the first 12 months, you could return the car—no questions asked. While the competition was talking about interest rates and finance incentives, Hyundai’s message was “we got your back.” This compelling offer first aired during the Super Bowl, and sales of new Hyundai vehicles increased by 47%, an all-time high. The compelling offer clearly separated Hyundai from their competition and helped move their brand from “low-cost import” to one of the “best cars on the market,” without sacrificing price. This phase is all about what your potential borrowers see, hear, think, and feel about your branding and marketing message versus your competition. SHOCKER (said sarcastically)—what we found was that most financial institutions market auto loans on brand name interest rate alone. HELPFUL TIP: The key to a great auto lending/marketing strategy today is having a message that goes above and beyond interest rate. Be a purple cow by showing you have those intangible and tangible assets that others simply don’t possess (or at least aren't touting if they do). By flipping the script on your customers and giving them a compelling offer, you will drive more loan applications. Many financial institutions I work with have loan applications on their website, but many are cumbersome and difficult to complete from the borrower’s perspective. In addition, many consumers prefer to do business at night or on the weekends, when most financial institutions are closed. Whether lending is centralized or done in the branches, you need to make sure the application process is easy for the borrower and as efficient as possible for your lending team. Quick decisions are important here, too. Nothing hurts your brand more than having applicants waits days or weeks to find out if they've been approved. HELPFUL TIP: Instead of just informing someone of their approval status, give them more information on what to do next. All borrowers should be contacted by their loan officer as soon as possible, and if they are approved, arrangements should be made for closing. If they aren't approved, be sure to thank them for their loan application, give them some insight as to why they weren't approved, and then offer information on how they can turn things around and gain your approval in the future. One way to ensure timely follow up is by using SWBC’s continuous borrower contact strategy. We can help you implement an effective ongoing email campaign that instills greater borrower loyalty, while increasing loan volume, retention, and refinancing rates. And, our loan origination team can supplement your efforts on nights and weekends. Having an effective, more engaging follow-up process in place will make sure you book the loans you approve. Obviously this is a very critical phase and the area of most concern for financial institutions because this is where the risk lies that your borrower will choose another option for financing their vehicle. Losing the loan here means more than just losing a customer; it also means losing the opportunity to earn non-interest income from ancillary loan protection products. Financial institutions that have the ability to accept electronic signatures close more loans than those that don’t, and tracking funding ratio (“look to book”) can help you understand what loans you’re losing and why. However, offering something of unique value (remember the purple cow) will keep your borrower from going somewhere else. HELPFUL TIP: A good way to get people to choose your auto loan every time is to make the closing process as quick and easy as possible—not just for your customers, but for your loan officers, too. You already lured someone in with your compelling offer in the awareness phase and got them to act in the application phase; however, this doesn't mean it’s smooth sailing from here on out. They haven’t given you their business until they’ve signed the dotted line at closing. If a customer is working with a loan officer who looks overwhelmed, confused, or agitated because of the steps they have to go through to complete the loan process, it could cause that person to lose trust in your compelling offer, your loan, and your institution. Make sure your loan officers have the tools and resources available to do their job as efficiently as possible. If they have to go to several websites/applications to get the loan closed and the ancillary products/services ordered, this is a sign that they aren't set up for success, and your customers are going to notice. This phase begins once the loan is closed and continues throughout the duration of the loan. The reality is, once the loan closes—in most cases—there is no ongoing communication with the borrower unless they get behind on their payment. HELPFUL TIP: Just like any other business, once you get a customer, you have to keep them happy and engaged or risk losing them to someone else. Providing ongoing communication could actually set you apart from the competition—especially if it includes information that your borrower finds valuable. You know what make/model of vehicle they bought, so you could send out periodic maintenance tips or reminders to adhere to their recommended maintenance schedule. The goal here is to have a robust recapture program in place to encourage your borrowers to finance their next loan with your institution. Knowing when the loans you closed (and the ones you didn't) are close to the end of their term, and having a formal process in place for follow up will greatly improve your results. If you’re looking to change your message from “low rates” to the “best auto loan” without sacrificing rates or underwriting guidelines, SWBC can help. Through our AutoPilot® Lending program, we are the exclusive provider of a vehicle return program, along with other products and services that can be used to customize your compelling offer and create borrower loyalty. We help implement a formal process to manage follow-up and target messaging at each stage of the lending life cycle to educate your borrowers and remain in positive contact with them for the life of the loan.